4 egg whites 250g (8oz) caster sugar 1½tsp cornflour 1½tsp whaite wine vinegar . 375ml (13fl oz) double or Whipping cream 60g (2oz) stem ginger in syrup, cut into matchstick-thin strips 1× 400g (13oz) can pineapple rings, drained . Pavlova meringue is crisp on the outside, soft and slightly chewy like marshmallows inside. 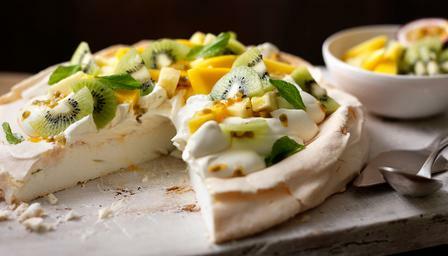 This pineapple and ginger topping is good in winter, but if you want to make a summer pavlova, use sweetened fresh red berries instead – and omit the ginger. 1- Preheat the oven to 160ْ C (325ْF, Gas3) . Mark a 23cm (9in) circle on a sheet of non-stick baking parchment, turn the paper over, and line a baking tray. 2- Make the meringue: with an electric mixer, whisk the egg whites until stiff but not dry. Whisk in the caster sugar, 1tsp at a time, keeping the mixer at full speed. Blend the cornflour and vinegar and whisk into the egg white mixture. 3- Spread the mixture inside the circle on the baking parchment, building the sides up so that they are higher than the middle. Place in the oven, then immediately reduce the heat to 150ْ C (300ْF, Gas 2) . 4- Bake the meringue for 1½ hours or until firm to the touch. Leave the meringue inside for another hour. Peel the lining paper from the meringue, and transfer it to a serving plate. Leave to cool. 5- Before serving, whip the cream until stiff, and stir in half of the stem ginger strips. Spoon the mixture into the middle of the meringue. Top with the pineapple rings and the remaining stem ginger strips. Keep the oven door closed when you leave the meringue to dry out, but if you have a fan-assisted oven, you should leave the door slightly open. The meringue base can be made a day in advance and kept in an airtight container in a cool place until needed. Add the cream and fruit topping just before serving.